1860s – present Oregon and Washington State, now 85% of US production. It did not take long for settlers in New England to get started. Hops were introduced to Massachusetts in 1628 and a brewery built in New Amsterdam (New York) 1633. Wilmington, 16 miles from Boston became known as Hop Town. The profits were enough to tempt growers and dryers in various parts of New Hampshire, Maine and Vermont to try hops. Madison and Otsego Counties in central New York State (just east of Syracuse and the Finger Lakes) dominated the hop industry from the 18th Century to the mid-19th C. This was the most long lasting of the US hop regions, although suffering a dramatic decline in the early 20thC due to disease and Prohibition. 19th C pioneers arriving in Wisconsin in the Mid West found hops growing wild. The rise in production there was described as meteoric. But in due course both New York State and Wisconsin were eclipsed. The productivity of Californian hop grounds in the Sacramento valley was double the performance further east. The craze in Californian for hops was likened to the gold rush . The next major development was the Williamette River Valley in Oregon. Independence, Oregon was described as Hop Centre of the World and Oregon led US production before and after the First World War. Prohibition played havoc with demand for beer and therefore hops, but export markets in Europe and elsewhere took a substantial proportion of US production. The Meeker hop kilns, Puyallup, Washington State.. Early 1900s. Photo courtesy of Washington State Historical Society, Tacoma. As a snapshot from 1879 (Meeker p65) New York State had 38,900 acres under hops compared to 4400 in Wisconsin,,1100 in California and 500 acres in Washington/Oregon, but production per acre on the West Coast was more than double the East. Now, in the early 21st C almost 100% of US production is from the Pacific North West, three-quarters from Washington State and modest amount from Oregon and Idaho. Woodstock Maine. ( Photo 1980s Kirk Mohney prior to demolition.) Said to date from later 19th C but it gives an image of what early New England hop houses may have looked like. Note the position on sloping ground to allow direct entry to drying floor above the furnace. There is little surviving evidence about hop houses and drying operations in the 17-18th Centuries in New England. There were no manuals on how to build a kiln and dry hops, comparable to the works of Scott, Bradley or Lance in England. There are no descriptions of early hop houses. 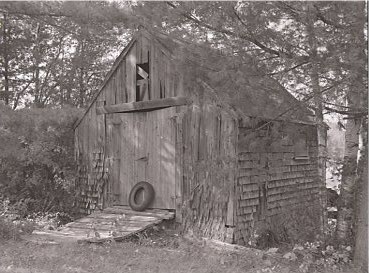 If simple, barn-like structures on the English model were built in New England for hop drying none seem to have survived. This is not surprising because few agricultural buildings of any kind from the 17th-18th Century have survived. Smaller crops of hops were dried in the open air. The first hop kilns were built of stone or clapboard like a small square storage barn. They were built into the side of a steep bank so that the hops could be carried straight on to the drying floor at an upper level at the back while the ground floor at the front gave access to a wood burning fire and later a wood fired cast iron stove. Records show that charcoal fired kilns became popular in Massachusetts in the 1790s. One of the first American descriptions of a hop house is by Israel Thorndike of Massachusetts in 1823. He was still focused in the idea of a stone structure built into the side of a steep slope. Instead of the pyramidal roof of English kilns, he showed a 12 foot square building with a gap below the eves to vent fumes and a shallow gable roof sitting on top like a hat. The design of a cooling room is not specified, probably because the dried hops were commonly carried from the kiln to a separate barn to cool. There are a good number of surviving hop houses from the19th C in upper New York State, notably in Madison and Otsego Counties. 14 Hop Houses are illustrated in the Madison County Hop Heritage Trail Guide. They range in date from about 1840 to the early 20th Century and are small and simple compared to contemporary hop kilns in England. Most had only one kiln. Some were one up, one down buildings in stone or wood, the fire below and drying floor above. This was a cheap formula but the dried hops had to be moved to an adjoining building to cool. More typically later 19th C hop houses were made up of four rooms – furnace, drying floor, cooling floor and bag storage. A common design was known as a “balloon frame”, a strong frame of vertical posts stretching from the ground to the eves of the roof, joined horizontally and supporting the roof. The walls were clad with wooden boarding lying horizontally on the kiln walls and vertically in the cooling barn. Air vents at the foot of the walls provided draught. Few had distinctive cowls as the smoke and fumes were extracted through gaps below the eaves or simply by opening the windows of the upper story. A 19th C wooden hop house of balloon construction in Otsago County, the heart of hop fgrowing in New York STate. Photo 1937 Library of Congress. A good insight into American ideas on hop drying is gained from a collection of 9 essays submitted to the American Agriculturalist and collected into a book Hop Culture by Ezra Meeker, in the 1860s. Contributions came from Vermont and New Jersey as well as central New York State. 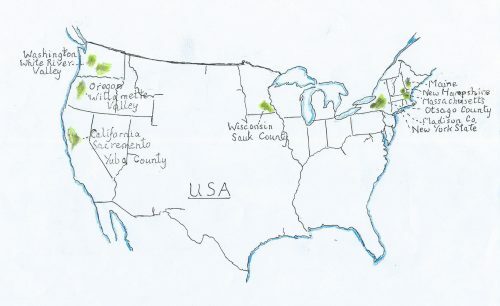 Hop growing and drying in the mid-West was centred on Sauk County, Wisconsin, (north west of Chicago) At its peak 1/5th of world production grew in Sauk County. The Wisconsin hop craze was stimulated by 700% increase in prices and production rose from 1860-67 from 135,000 lbs to 6 million lbs. Hop kilns in Wisconsin seem to have been on similar lines to New York State but larger. Instead of being square they were oblong, 18 feet wide and 30 feet long and the drying floors of one or more kilns about 9 feet off the ground. They had a number of charcoal stoves. They must have looked not unlike the “barn style” kilns of 18th C Britain. Yet at the same time little “retro” hop kilns were being built of wood and shingle roofing. The construction of pyramidal square kilns started in the later 19th Century, at least 50 years later than in England. A New Encyclopedia by Abraham Rees brought over the Atlantic and published in Philadelphia in 1820 described 10 foot square kilns with drying floor 5 feet above the charcoal stove. 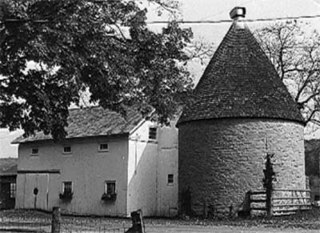 Loudon’s Encylopedia of Cottage, Farm and Villa Architecture was also well known in America and will have introduced hop farmers to the idea of round kilns. English ideas of elaborate stoves such as cockle stoves did not take off, perhaps because of the ready availability of cheap fuel. Most kilns had louvred vents rather than cowls. 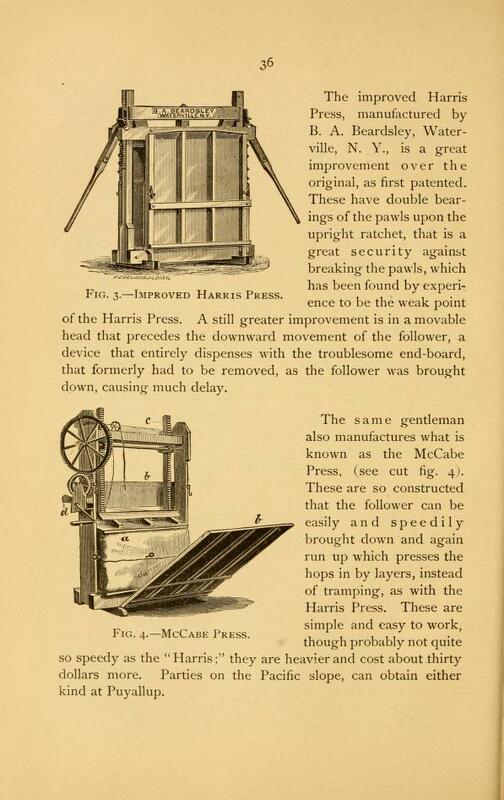 Mechanised presses as illustrated in Ezra Meeker’s book from the 1860s, well in advance of anything in Europe, but not copied in Europe. In the later 19thC the push for technical advance was stronger in the US than Europe. In the 1860s patents were taken out for rolling hair cloths pulled across the kiln, and movable trays. The hops travelled along tracks into the kiln and out onto the cooling floor. These were the forerunners of today’s mechanised drying. Oil fired burners and fans to blow hot air through the crop were introduced. Mechanised hop presses replaced the old treading down of the hops in the bag. 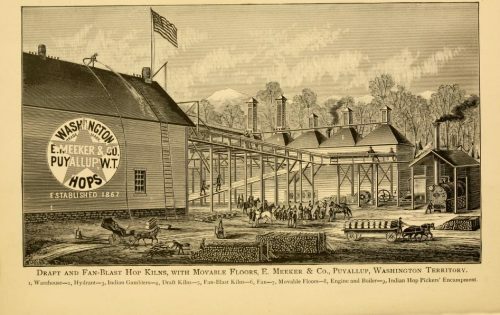 The first recorded hop house in California dates from 1861. 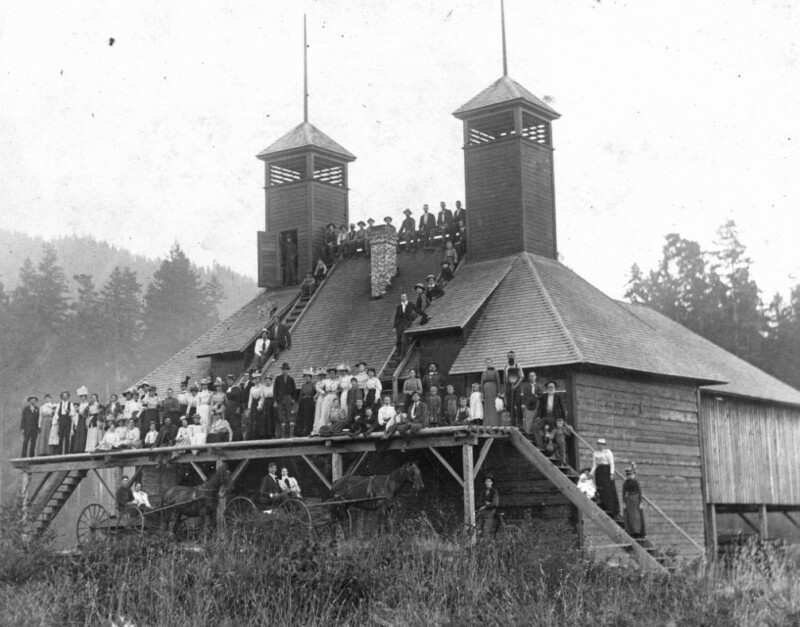 A few years later the first hop house in Oregon was built in Marion County. Most of the earliest Pacific Coast kilns were much like their eastern brethren, two up, two down frame buildings. A striking features of US hop houses is that small and simple buildings went on being built long after some growers had moved on to far more modern kilns. 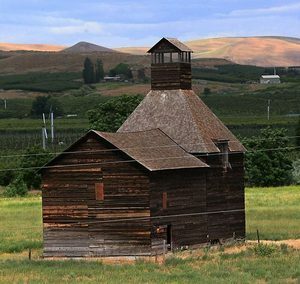 This example at Yakima County, California looks as though it might date from the 17th-18th C when it is in fact contemporary with the large installations at Puyallup. The Puyallup Valley in Washington State emerged as a star hop growing and drying area. This was in part due to the drive of Ezra Meeker and his family who travelled west from Ohio in 1852 on the Oregon Trail. 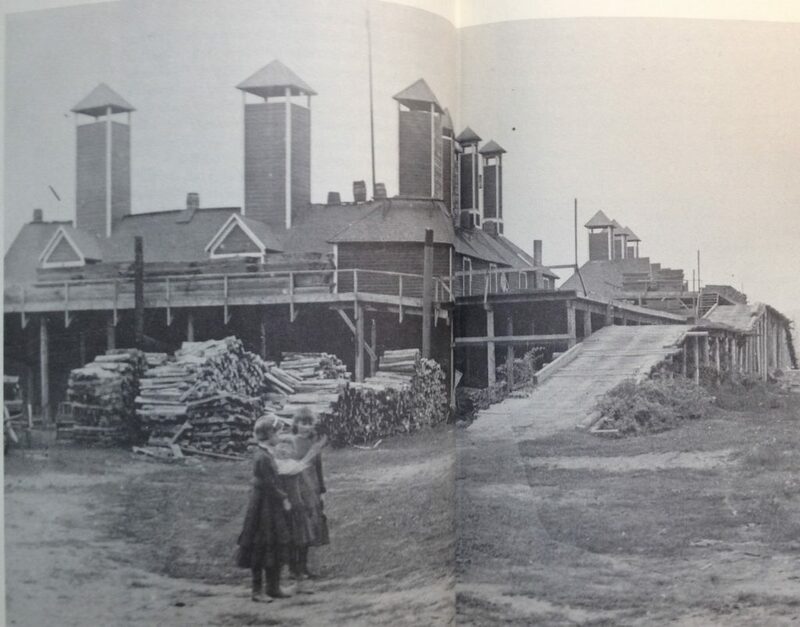 Their first kilns were log structures but they moved on to build some of the largest hop houses of all time. They went from extreme hardship to great wealth, “Hop Kings of the World”, only to be decimated by disease and pests. 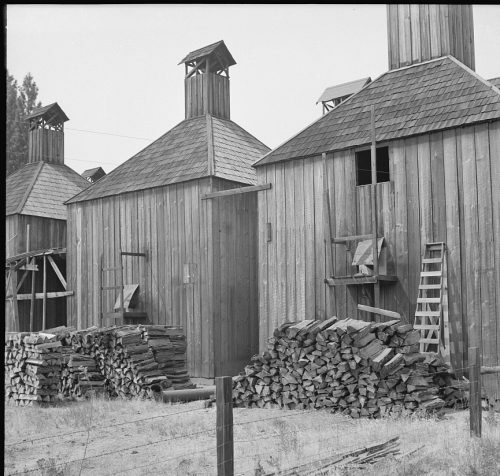 Kilns with tall chimneys became a feature in Oregon and Washington State, reminiscent of the Three Chimneys oast in Kent. There is no evidence that the ideas were drawn from the Old World; combined with electric fans chimneys they were an obvious way to enhance air flow. Wood construction was increasingly replaced by concrete, metal and manufactured composite sheet materials. Employment in the hop fields and hop houses dropped dramatically as mechanisation took over. The important role of hop businesses in local communities and social life in the 19th and early 20thCenturies withered. The era of Prohibition of alcohol, 1920-33 played havoc with demand for dried hops. Since 2010 hop production in the USA has almost doubled, boosted by the craft beer revolution. Information on the current scene can be obtained from the website of Hop Growers of America. 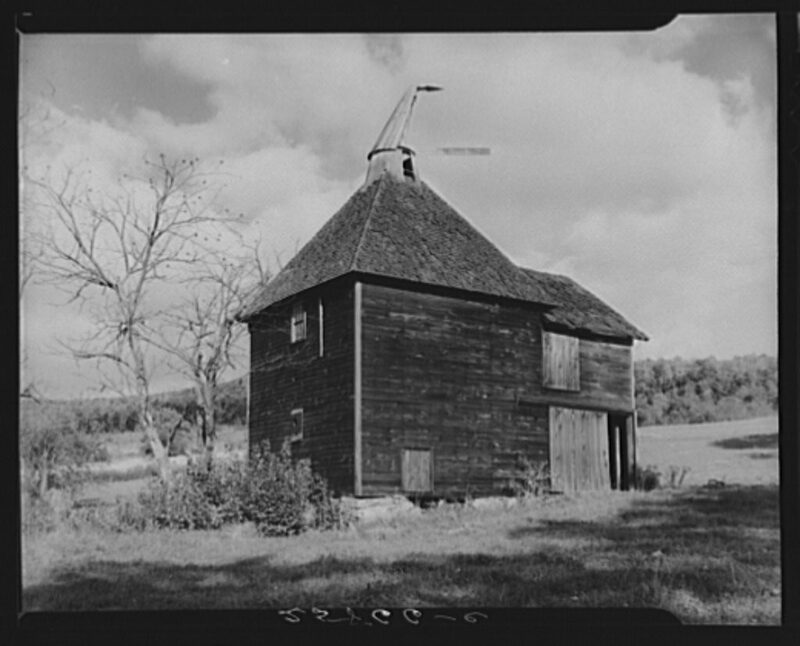 Information and images of historic hop houses are manly found on the websites of specific Counties in former hop growing areas, some of which are mentioned above; also in the Image Library of the Library of Congress.